Breitbart is incensed. Rush Limbaugh hates to see it. And Fox News host Tucker Carlson thinks President Donald Trump is engaged in a "self-destructive act." Trump's recent attacks on Attorney General Jeff Sessions has touched off a firestorm of outrage inside the pro-Trump media universe where the Alabama Republican is revered as a conservative icon. "I hate to see him being treated this way," Limbaugh, who stressed he understood Trump's frustrations, said Monday on his nationally syndicated radio program. "He's a really fine man, and he is a fighter in his own way." The conservative talk radio king added that he found it "a little bit discomforting" and "unseemly" for Trump to "go after such a loyal supporter that way." Trump has raged against Sessions for days, venting about the attorney general's decision to recuse himself from the investigation into Russian election meddling. Last week, he told The New York Times he would not have appointed Sessions had he known he would step aside from the probe. On Monday, the president called Sessions "beleaguered" in a tweet. 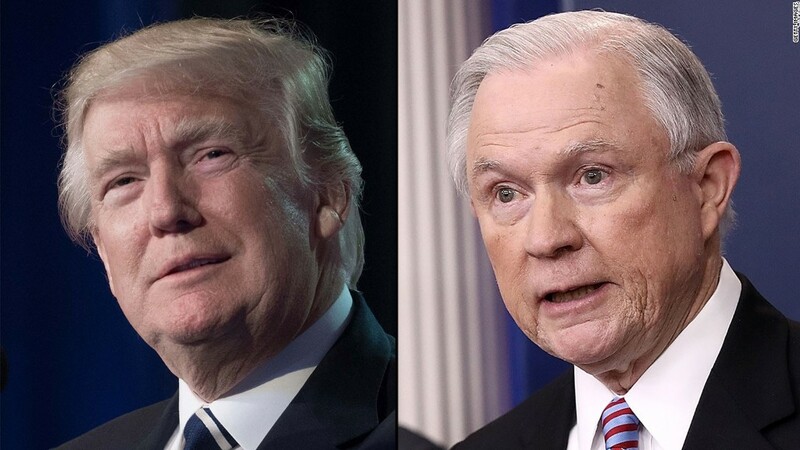 And on Tuesday, Trump took to Twitter again to say that Sessions had "taken a VERY weak position" on pursuing a possible case against Hillary Clinton's use of a private email server -- something the President said after the election he did not want to do. "Attacking Jeff Sessions was ... a useless, self-destructive act," Carlson said on his television program last week. "The first rule of politics, as in war, as in life, don't shoot the friendlies." Over at Breitbart, the unabashed pro-Trump website formerly headed by White House chief strategist Steve Bannon, some writers are said to be furious over Trump's treatment of Sessions, a person familiar with internal conversations told CNN. Former staffer Michelle Fields, who left the site last year amid controversy over the Breitbart's handling of an altercation between her and then Trump campaign manager Corey Lewandowski, explained to CNN that Sessions was "nothing but nice" to employees at Breitbart. She added that Breitbart staffers likely "feel more loyalty to him than Bannon." Late Tuesday morning, the website splashed a story on its front page zeroing in on Trump. It linked to a story that said Trump's "decision Tuesday to attack Attorney General Jeff Sessions over Sessions' 'position' on Hillary Clinton's various scandals only serves to highlight Trump's own hypocrisy on the issue" and "is likely to fuel concerns from his base who see Sessions at the best hope to fulfill Trump's immigration policies." Tuesday's banner headline on the Drudge Report, a highly-trafficked and influential conservative news aggregation website, warned of a Republican "CIVIL WAR." It linked to a McClatchy story that said Trump is "getting a bitter Washington lesson when he messes with Jeff Sessions -- you don't pick a fight with one of the Senate's guys." A report published on Monday in Axios said that Trump has considered replacing Sessions with former New York City Mayor Rudy Giuliani -- something that Lucian Wintrich, the White House correspondent for the far-right Gateway Pundit website, told CNN worried him. "I can understand Trump's frustration with Sessions," Wintrich wrote in a text message, "But I think he was a great pick and I cringe at the thought of him being replaced with [Rudy] Giuliani." That said, Trump does have his defenders. Jim Hoft, publisher of the Gateway Pundit, told CNN in an email that Sessions "never should have recused himself" and argued Trump is "right to be angry." "This sideshow has gone on long enough and Sessions either needs to lead the DOJ down a new path or resign," Hoft wrote. And Sean Hannity, perhaps Trump's most loyal soldier on cable news, seemingly ignored the controversy surrounding Trump's attacks on Sessions during his television program Monday night, according to a transcript of the show. The reaction from conservative media could factor into whether Trump chooses to fire Sessions, according to a report in The Washington Post. The newspaper reported on Tuesday morning that Trump had asked a person close to him how axing the attorney general "would play in the conservative media."